Rated R for bloody violence and language throughout. You don't need to know anything about Henry Rollins to appreciate his tongue-noticeably-in-cheek action hero performance in horror/superhero genre hybrid "He Never Died." Rollins, the more charismatic of the two former frontmen of American punk band Black Flag, has a Schwarzenegger-ian, block-o'-meat-style quality to his performance. He plays Jack, a musclebound mystery man who keeps to himself until he feels obligated to investigate the kidnapping of Andrea (Jordan Todosey), his estranged, 19-year-old daughter. Jack isn't super-strong, but he is built like a tank, and he emotes like one too. Nothing phases him, save perhaps for when he reveals that he understands, and can even talk sarcastically. Still, Rollins plays Jack as if he were the demonic love-child of the Terminator and Starman, a stranger from afar who is unaccustomed to, or perhaps just uninterested in human niceties. I say that "He Never Died" is a horror/superhero sub-genre because Jack is the kind of meathead martyr who could either become a Hulk-style monster, or hero depending on his mood. Jack may be slightly more self-aware than most characters cast in this particular mold, but he's still essentially the kind of archetypal anti-hero that David Cronenberg's "A History of Violence" follows/comments on. Jack has a dark past. He avoids dealing with it by playing Bingo by himself and eating bland food, like oatmeal and tea, at his favorite diner. This attracts the curiosity of savvy yet powerless women like Andrea and Cara (Kate Greenhouse), the waitress at Jack's favorite diner. But Jack is a recluse beyond his regularly-scheduled appointments with what appears to be a young drug dealer. He sleeps. He gets headaches. He eats. And he stems the volcano of rage that motivates him by not giving a care about anything else. Were it not for Rollins, Jack would be a fairly basic part. The character is written—by neophyte writer/director Jason Krawczyk—in a smirky self-reflexive way that freely acknowledges its derivative nature without actually doing anything about it. Even if you ignored how wacky-quirky it is that man-shaped mountain Jack plays bingo because "it's something to do," you'd still have to deal with the character's inconsistency. For the most part, Jack talks like he doesn't know or care about anything beyond his immediate sphere of influence. He's comically literal-minded, as in scenes where a thug threatens him by asking him to come have a chat with him, and Jack simply replies "I'm fine here." When Cara tells Jack that he's intimidating, a flat OK suffices for him. But Jack sometimes reveals he's in on the film's joke, like when Cara asks him what the Civil War was like, and Rollins replies with a priceless glare. Jack is an ideal role for Rollins, a bulldozer of a public figure who is sadly now more famous for being an insistent, and sometimes insensitive political gadfly than he is for being a great punk rocker. In his LA Weekly column, Rollins wrote that it's "impossible to feel bad for [Robin Williams]" because Williams killed himself. Soon after that, Rollins apologized in his own inimitable Jesus-complex way. He wrote: "I cannot defend the views I expressed. I think that would be taking an easy out. I put them out there plainly and must suffer the slings and arrows — fair enough." Rollins is open to the idea that he's wrong, but he's most convincing when he offers to take flack from people who were understandably upset by his, well, upsetting comments. Jack is that kind of guy, too: he would sooner take a punch, and then return the favor than just use his considerable strength to swat his opponents away like mayflies. Jack's superpower is knowing that he's strong enough to take on anyone, and win. He's a perfect tragicomic figure because he's strong enough to feel guilty about his power, but not strong enough to care about anyone but himself. 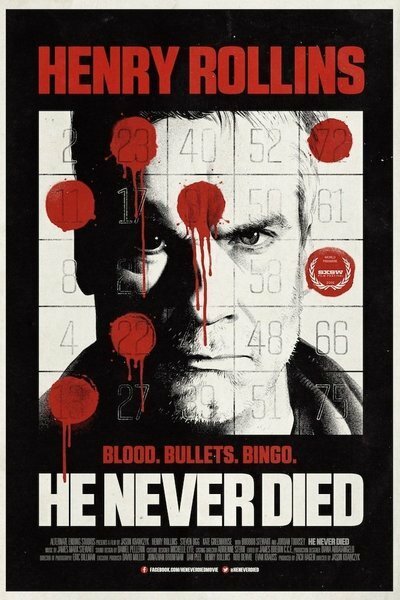 So if you're wondering if you should see "He Never Died" or not, consider how much time you want to spend in Rollins's company. He proves himself to be as charming as a younger Arnold Schwarzenegger, but his appeal is just as limited. The best way to figure out if "He Never Died" is for you is to consider the scene where Rollins, as Jack, rattles off a list of odd jobs he's performed during his life. Jack's list is interminable, which is itself funny. But Rollins's comic delivery really makes the scene great. Rollins may be viscerally thrilling when he effortlessly takes down bad guys, but he's even better when he's acting like a wayward alien (the closest analogue I can think of is Patrick Warburton as the title character in the short-lived live-action "The Tick" television series). When Jack rattles off his earlier occupations, Rollins mulls over each of his character's gigs as if he were a child gnawing on a very tough piece of steak. He doesn't know if he likes the taste in his mouth yet, but he chews each bite thoughtfully. It's a gut-busting sequence that proves Rollins is, like Wolverine and other monstrous good guys before him, the best at what he does.